My brother, Dakota, got his first deer of the year tonight. At first we thought he hit the shoulder and didn't get good penetration, but on the video you can see the arrow go in almost to the fletchings then break and start to fall back out. The 160gr Stos on a cedar arrow made it all the way through and we found her about 100 yards away. He's shooting a Thunder Stick Mag 45@28. Thanks for posting, congrats. Really nice video. Nice work on the nanny!!! Nice shot! Very cool video! Thanks for sharing! That is a big old girl!! Great video too! Congrats on a fine doe!!! Cool video. Great shot and video! Congrats. Nice video fellow's!! 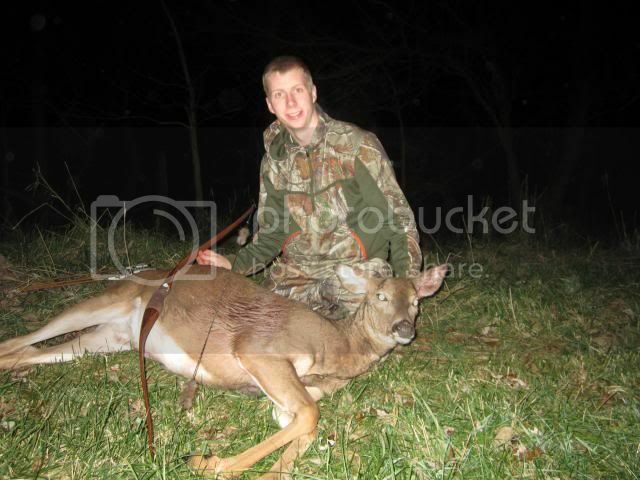 Congrats on a nice doe!